The Brooks Studios are situated in South Africa's Gauteng province in the town of Edenvale on the East Rand, in close proximity to Johannesburg and Bedfordview. 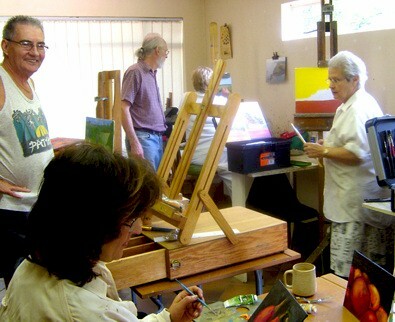 I offer both morning and evening classes, five times a week, catering for all aspiring artists. All new members of my classes start off with drawing. I am a believer in "look and see", and drawing "still life" encourages the right frame of mind in the student. This initial drawing stage is the only time that I specify subject matter. Once students move on, the choice of subject matter and materials (e.g. oils, acrylics, watercolour, pastels, pencil, charcoal, or gouache) is entirely their own. I help with technique, use of materials and colour mixing, guiding students' progress without stifling their individual vision and creativity. 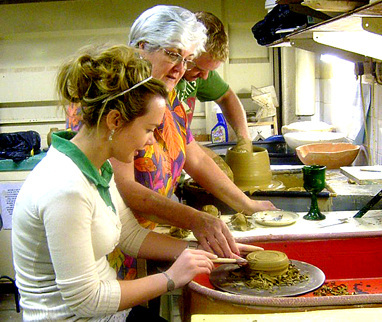 Mary Brooks and Linsey Bannan offer both day-time and evening classes, five times a week between Wednesdays and Saturdays, teaching both hand and wheelwork, earthenware and stoneware. We find running informal classes leads to satisfaction amongst the students - some are daring and different, but, each student has a contribution to make in inspiring and stimulating the people around them. We like our students to grow at their own pace and encourage them to have fun for a few hours, as we guide them in making pottery that they enjoy creating. This helps them to forget the outside world as they concentrate on the clay and let their intuitive responses manage their artistic expression.